Of course, nobody woke up one ill-starred morning of 410 and, learning of the news of the sack of Rome by the Visigoth Alaric, or later in 476, when the Germanic Odoacer deposed Emperor Romulus, exclaimed, “OMG, the Middle-Ages have begun!”. 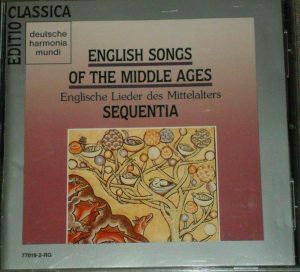 The “Middle-Ages” is a concept coined by much later historians. Writers of the era considered themselves, after Augustine, to have beeen in the “6th Age” since the birth of Jesus Christ (see the Wikipedia entry on “Six Ages of the World“) and in the 1330s, Italian poet and humanist Petrarch referred to the Christian era as “The New” Age. It is the later Humanist historians, starting in the 14th century, who saw their own times as a revival, a restoration (of Roman classical culture) or a “renaissance” after the Barbaric ages (and it is 16th century art historian Giorgio Vasari of first used the word “Rinascimento”), but the term of “Middle Ages” appeared only, according to Wikipedia, in 1604. 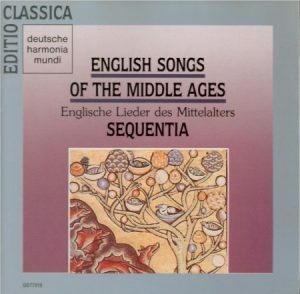 My point is that when one talks of “Medieval Music”, or finds a more specific program of “Medieval English Music” (as the one on Harmonia Mundi France 901154 by The Hilliard Ensemble, barcode 3149021311546), they are usually songs from the late Middle Ages, 14th or 15th centuries, which was already the early or first Renaissance. 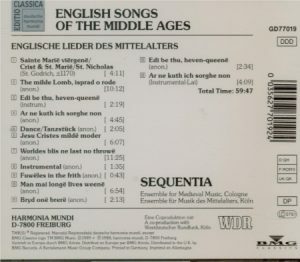 So the interest of Sequentia’s recording of “English songs of the Middle Ages”, recorded in 1987, is to give us what are really the earliest extant English songs. “The repertoire of songs in English from the 12th to the early 14th century is surprisingly small. We know that much music composed to English texts is lost to us (due to the oral mode of vernacular song transmission), and must therefore content ourselves with the less than two dozen pieces, some in fragmentary form, which have survived in a variety of manuscript sources including a saint’s life, a book of miscellaneous religious writings and even the reverse side of a papal bull. 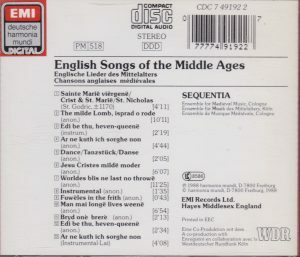 Unfortunately, there exist no large manuscript collections of English song comparable to the chansonniers of the Troubadours and Trouvères, since the courtly literate, – and therefore written – tradition in England before Chaucer’s time was largely French.” In fact, the earliest recorded non-anonymous English song seems to be the four Marian songs of St. Godric (see Wikipedia’s “Godric of Finchale“), performed here on track 1. Wikipedia gives his dates as “c. 1065-1170”, which make him a near-contemporary of Hildegard of Bingen (1098-1179), but also die suspiciously old. 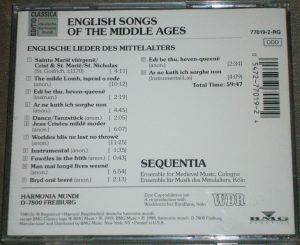 The music as performed by Sequentia is sparse and bare – laments, ballads -, instrumental accompaniments reduced to a bare minimum, sometimes just fiddle (track 2, 4) or harp (track 7), sometimes none at all (track 1, 6, 11, 12), texts are religious (Mary and the sufferings of Christ, World’s bliss does not last) and the era, as reflected in those songs, does not seem to have been particularly jocular. Songs are sung either solo, duo or even trio (two men, including Sequentia’s founder and leader Benjamin Bagby, and founder soprano Barbara Thornton). Four tracks (out of 13) are purely instrumental dances. The songs sung by Barbara Thornton are of ineffable beauty (tracks 2, 7, 11), lamenting ballads that could have been sung by Joan Baez, and Benjamin Bagby sings “Man mai longë lives weenë” (Man may expect long life… but is often deceived), track 10, with great sardonic wits. But the main fascination of the recital is perhaps the language, Middle English. It’s both entirely alien – sometimes it sounds like a strange German dialect, even like Yiddish – and, when you follow on the translation in modern English, strangely familiar, and it mysteriously adds to the fascination of the music, as a treasury buried deep, lost, inaccessible, and yet visible, a hazy and fragile recollection of a world disappeared in the aeons of time. 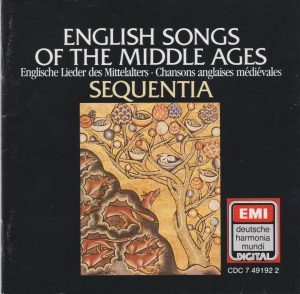 The musicological credentials of Sequentia are undisputable – including consultation of the original manuscripts and help from and credits given to two scholars from the University of Leeds and the University of Texas on the pronunciation of Middle English. Erudite liner notes, texts of songs given with translations in English, German and French, TT 60 minutes. For whoever’s interest, there is also an edition of this disc licensed by The Musical Heritage Society, MHS 514451M barcode 717794445121, and a Japanese edition, BVCD-3871, barcode 4988017658277. For more on Sequentia, see my complete CD discography. And here’s one I’d like to offer to the fans of Bernie Sanders, the last stanza of Worldes Bliss, to go and chant in Wall Street every day. mid iwis hi byeth thi vo. thet is vor to to thee wo. man, and eft hit wel thee liket. for certain they are your foes. that is in order to do you harm. man, and afterwards things will please you well. earns himself torment for ever more! Maybe it’ll convert all those bankers and traders to socialism, it’s worth a try.